Satisfy your excitement and see The Hunger Games: Mockingjay – Part 1, It opens in theaters on November 21st, so please check it out. This the Season to Enjoy Music! As the holiday season approaches, we have something special to share with you – some of the fabulous music CDs that we’ve recently endorsed. This music will surely be enjoyed by your children but, like most wonderful music, adults will find it equally pleasing. In 2014, the knowledgeable music critic John Wood joined our ranks as a music judge and, of course, our KIDS FIRST! Critics added their two cents in addition. Take a look below. I’m sure you will find some fabulous choices to share with the youth in your universe this holiday season. APPETITE FOR CONSTRUCTION (AGES 2-5). These songs provide an active participation point for whole-family engagement, celebrating imaginative play, building, dance, puppet making and more. “We wanted to make something that wasn’t only about listening, but could actually be recreated and re-imagined at home,” explains Stein. “The Pop Ups are all about making things,” adds Rabinowitz. “We want our fans to be able to engage in that experience for themselves and really take part in the record, and to experience The Pop Ups world.” THE POP UPS. Adult Juror Comments: Stop the presses! Late breaking news: The Pop Ups have done it again! 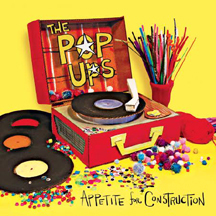 Their latest album ‘Appetite For Construction’ is a fanciful, danceable explosion of ideas and get-down rhymes and rhythms. The group is in touch with its musical lineage and producer/arranger Jason Rabinowitz does a masterful job of paying/playing homage to a myriad of pop culture voicing and styles. The group has a special spark and presents a moving target of attention grabbing hip nouveau vaudeville. Oh, and by the way, I liked the album. This is a finely constructed and produced album from the first downbeat. Nothing unappealing unlike a banana. Each song segues into the next seamlessly with a myriad of pop culture styles. Their liner notes hit it on the head, “This album is dedicated to the simple joy of making things with family & friends!” The group knows how to integrate terrific music with creative voice work that they perform live with the puppet portion of their shows. They always present a moving target of attention-grabbing modern vaudeville. Top rate sound quality has layers of harmonies, excellent musicianship and masterful recording technique. Reviewed by John Wood. Kid Juror Comments: The kids absolutely loved this CD, especially the upbeat music that made them dance. They liked the vocalist, the instruments and the fun music. The kids that reviewed the CD were ages 2-7. The slower songs were not as enthusiastically enjoyed as much as the faster paced ones but. overall they really enjoyed this. One 2-year-old came running in from another room dancing along to it. Their favorite song is “Getting the Job Done” and they repeatedly said, “give it a 5” (rating). Audio. 40 min. ; $12; Age: 2-5. AS THE CROW FLIES (AGES 2-5). 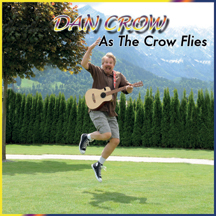 Family recording artist Dan Crow offers a brand new collection of original songs that celebrate his fun with travels around the world. ALLS HOUSE FAMILY ENTERTAINMENT. Kid Juror Comments: This CD has a lot of fun and catchy songs. The lyrics don’t always make sense and are sometimes just silly but they will make kids want to laugh out loud and dance around the room. The instrumental part is a very strong part of the CD. It is what will make you want to get up and dance around. Even when the words are a bit too silly the instrumental section holds your attention. Although, young kids may not learn a lot from listening to the CD, they will enjoy the music and sometimes that is just as important as learning something new. I did learn something from the song “Bully Girl and Bully Boy.” The music styles are pretty similar throughout the CD. There is some rhyming and the songs touch on topics such as the tooth fairy and the playground, things kids can relate to. 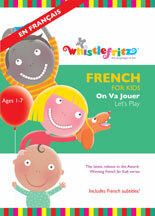 I recommend this for kids ages 4 to 8. Audio. 40 min. ; $12.99; Age: 5-8. Kid Juror Comments: This is a very cool music CD which includes 17 songs that demonstrate how to be polite and Well mannered, with a catchy beat! I honestly thought it may be a little cheesy but the CD pleasantly surprised me. The irst song of the album, “Cool Kind Kid,” is simply perfect for teaching younger kids about proper behavior. specific item. For example, one of my favorites, “When the Telephone Rings” talks about how to pick up and answer telephone correctly. There are 17 songs in total. Each of the songs is about two to three minutes long. All somewhat tell a story and even though you may not realize, all teach you a lesson as well. Most of the songs are catchy. However, there are a couple that feel a bit forced and probably would have benefited from a better singer. But those are an exception and I do like the fact that the majority of the songs are sung by kids. Since I’m 12, the songs were a bit childish for me but I could see a class of preschoolers enjoying it and singing along. I also found it very smart to make this for such little kids, so when they grow up, they have good manners and a clear understanding between right and wrong. Adult Juror Comments: Let’s start with the obvious, ‘Love Bug’ is a terrific album filled with lovely and entrancing songs. I could say, ridiculously, where have you been for twelve years? And the answer might be, doing lots of fun and satisfying stuff. It’s like we never missed you, Raffi. The soothing voice and positive artistic sensibilities are sharper than ever. The love for the individual child and family, care for our world and the simple joys of playing ice hockey, and enjoying the park are just a sampling of this splendidly produced and performed 16-song set. And a nod to the updated lyrics to ‘This Land is Your Land.’ Beautiful guitar work. engaging production and that voice that makes a stadium performance sound like a personal concert in your living room. Pick this up, you won’t put it down. I really like the choice of mainly acoustic instruments (guitars, banjo, fiddle, drums, bass piano and dulcimer). This music breathes. Raffi is one of the foundations of children’s music – a national treasure that generations have grown up with. There are terrific songs, exceptionally performed and spot-on for the target audience. The structure and continuity are near-perfect. The title says it all: Love Bug! 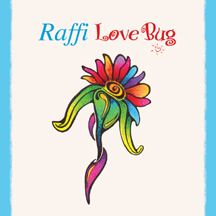 Raffi is all about love, respect, our planet and the power children have to change their surroundings for the better. Like Fred Rogers, he is true to himself, respectful of his audience and always in a gentle, loving way. He is a seeker of good intentions for the World we live in. Raffi’s voice is an instrument that soothes and draws the audience to scoot just a little bit closer. The kid choruses are lovely. The production fabulous. The musicians add so much energy and propulsion. I hope that children will see a bigger picture of their involvement and heir apparent to a smaller, brighter and more loving world. Kid Juror Comments: The kids really enjoyed this CD. This is the first time I’ve heard a Raffi CD and, although the lyrics are very intelligent and often mature, the kids still were completely drawn in to the songs. They sang along almost immediately and they wanted to hear more. After the original review, I started playing it in the car when they were out of control and they would immediately calm down and start singing along. They especially love the first two songs. Based on the kids’ reactions, I recommend this CD to anyone. They particularly loved the Dogwood Song and Love Bug was their second favorite. Audio. 40 min. ; $15; Age: 2-7. Posted in Member News | Comments Off on This the Season to Enjoy Music! Posted in Feature Film Reviews | Comments Off on Big Hero 6 – Suspenseful, Funny and Creative. Will This Be 2014’s “Frozen”? You are currently browsing the KIDS FIRST! News weblog archives for November, 2014.